Recently I hosted a Christmas themed Stamping Bingo Night and as always I designed 2 card kit packs for the guests to make during the evening. 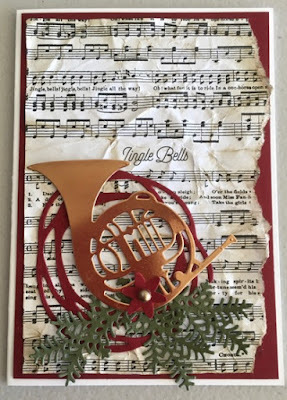 It is wonderful how the Merry Music Specialty Designer Series Paper goes so well with the Musical Season Stamp set and I've added a swirl from the Swirly Scribbles Thinlit Dies, plus branches from the Christmas Staircase Thinlits Dies. I love how these all work together. It was important for this project that I could prepare as much as possible to cut down on the time spent actually putting the card together, so I did all the die cutting, and cutting of card layers. This made the card go together easily and we could get back to some more Bingo games and lots of fun Stampin' Up! product prizes. 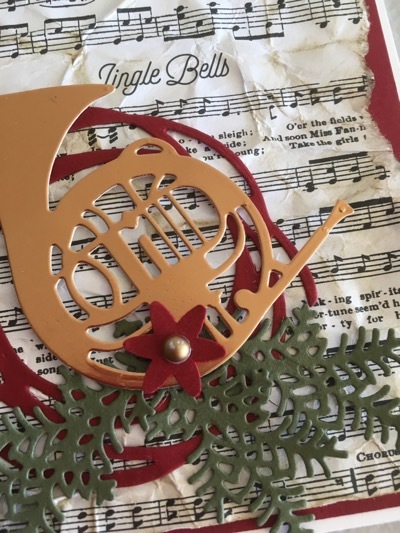 We crinkled the Music paper and sponged over with Soft Suede ink, just to add a little softness and patina to it. One edge was torn freehand and then adhered to Cherry Cobbler card stock. The focus of the card was made up of a Cherry Cobbler Swirly Scribble circle, 3 Garden Green pine branches and a Copper horn. The small flower is a punch (retired) and the gold pearl is one of the Stampin' Up! pearls that has been coloured with a gold Sharpie metallic pen. 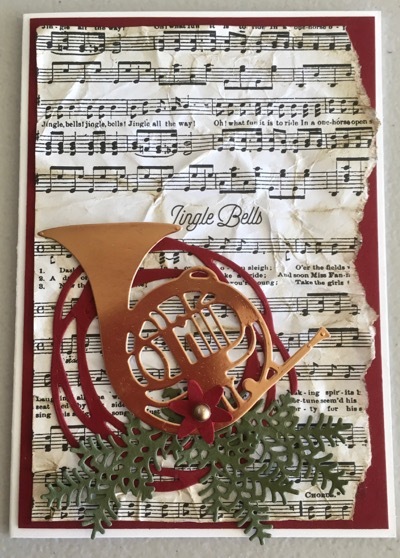 The card base is Thick Whisper White - I like to use this for the card base as it has good body and is easy to stamp or write on the inside. I hope you like this little old fashioned Christmas card. It was fun to make and everyone enjoyed it. Below you will find the products needed to re create something similar. You are welcome to order via my On-line Store. Just select the link to place your orders. 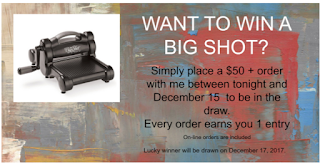 You may like to participate in my "WANT TO WIN A BIG SHOT" promotion that runs until December 15. You can email me or if you order on-line make sure your contact details are entered.